Can it get any cuter than this?? Now that the frame is up, the next job to complete is to put all the tongue in groove pine over the frame. As you can imagine, there is a lot of pine, and it takes a long time to get it all on there! This is a view from the top of the staging on the south wall, down into the house. This is the north west corner - there will be a door just to the left of that corner. Emma approves of the pine. This is the north east corner, where the master bedroom is on the ground floor. And a view from outside, looking at the north west corner of the house. And as promised, the new (rented) toy. It's called a zoom-boom and it's a forklift with an extendable arm that reaches 20 + feet. It sure is handy for getting lumber and things up to the roof! The second truck arrived on Monday evening carrying the remainder of the house materials coming from Maine. This includes the rest of the wall and roof panels, the tongue in groove pine which will line the inside of our exterior walls, and the decking for the second floor (tongue in groove hemlock). The next task is to start putting up the pine, and yesterday the boys got started on that after unloading the truck with our new (rented) toy (picture of that coming tomorrow). Unloading the first truck in the rain pretty much ruined Erick and I on working in the rain for a while, so last night we laid around and did laundry. By the way, I hope Crystal wins american Idol! I think that Musquash has some of the prettiest skies... Here is an example. This was Thursday evening, coming into Musquash. Here is the house Wednesday evening: The staging is up and all ready for the crane coming the next day to raise the walls. And here we are Thursday evening - the walls are up!! A view inside the frame - this doesn't do it justice. And a view of the frame as of Sunday evening. It's pretty surreal to see it up, after months and month of planning! As you know, the first load of our frame arrived from Gerald Fowler (Timber Frame Solutions in Thorndike ME) on Friday last week. Gerald has been great throughout this process - taking panicked phone calls, answering hundreds of silly (and not so silly) questions, and generally making it possible for us to get anywhere with our house. He has guided us through every part of the process - faxing us diagrams to give to the foundation guy, talking to the foundation guy, advising us on windows, tools, materials, electrical plans, etc. Pretty much for every single thing that we've bought, built, rented, or thought about for our house, Gerald's given us input. This week Erick has stayed home from work to begin putting the frame together. He's had some help, and in two days Erick, Wayne, and Garret have put on the sill plates, built the south, east, west, and one of our two north walls, and assembled all the gable ends. The next step in the frame is done using the crane again: everything gets lifted off the ground and secured in place. Emma thought she'd give our new slab a try this weekend.
" Hrmm... Why is my bum warm? I think it's safe to lay down..."
"It smells alright.... and it feels so nice on my tummy!" Well on Friday afternoon last week, the trailer arrived with the first shipment of our timberframe. We were blown away by the size of some of the beams, with the largest being 6" x 10" x 24'. Three men can't pick those suckers up! So Saturday morning, early if not bright, we went up to the lot to meet the boom truck to unload the trailer. The weather was, shall we say, not cooperating. The boom truck arrived at 7:45 am. We got underway very quickly - with Erick and I setting up blocking to lay the beams on, strapping the beams, hooking the straps to the ball on the crane, and Kevin (the crane guy) moving the loads where we directed. We pretty much layed everything out on the north and east walls of the frame, since the well digging truck was parked behing the house we had to leave the south and west sides free so he could get back out. And before we knew it, the trailer was empty! Well, ok, it took 2 and a half hours and it poured the entire time. BUT we were done by 11:00 am. After that we were absolutely exhausted, and spent the rest of the morning/early afternoon lying around being lazy. Solar Slab performing like a champ! 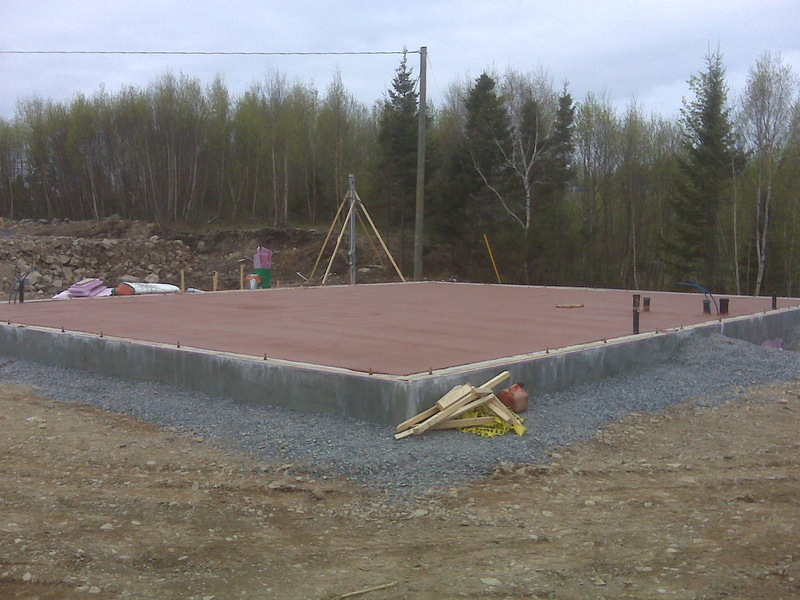 As you know, the slab was poured on Tuesday. 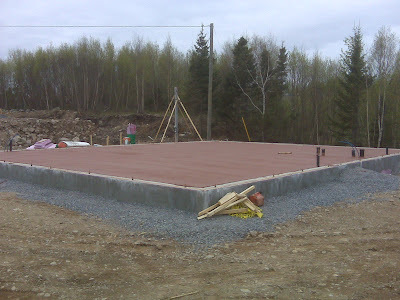 The whole point of having the slab is so that it will absorb heat from the sun and help to warm our house in winter. Well, yesterday was a sunny day, and when I went up to the lot around 7:30 pm, and sat myself down on the slab, it was pleasantly warm. It stayed warm until after 9:00, too. Yippee! I look forward to seeing how well it retains heat when it has a house (and walls) around it! Ok here is a shot that Erick took this morning right after they finished trowelling the concrete floor. This is not what the finished product will look like - it still needs several layers of sealant, and oh yeah, it also needs to dry! More later... (I will also be posting some pictures of the intermediate steps between the last update and now). I'm an amateur artist that works mainly in soft pastels and watercolours. My work is currently displayed at Bluefin Pottery and Hand Creations in Digby, NS. If you're interested in purchasing any of the paintings displayed here, leave me a comment. Look who's wearing a saddle! Longeing in the new arena!